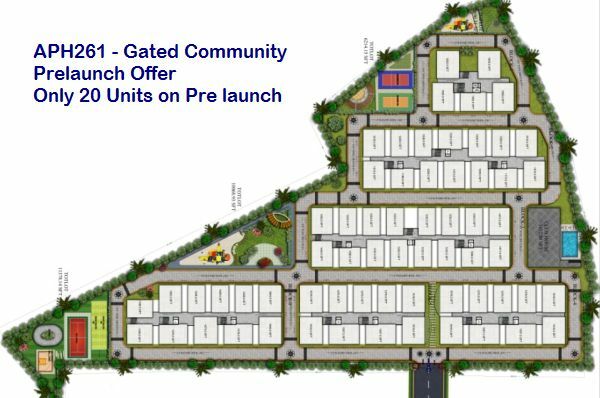 APH261 - Pre Launch Offer in Gated Community Beat the market rate by miles! Pre Launch Offer in super luxury gated community apartment project, 11 KM from Cyber Towers . 5 Acre Gated community project under approval. If you are on the verge of buying & wish to SAVE several lakhs, Contact immediately for details. This prelaunch offer is for sale of 20 Units at unbeatable rate of Rs.2000/sft (INCLUDING AMENITIES). APH261. Apartment Project near Borampet / Pragathi Nagar Road . Submit Booking Enquiry Form to Participate in this Pre Launch Offer.